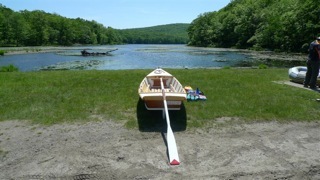 Richard Maldonado chose the 13′ QT Rowing Skiff design by Jim Michalak (www.jimsboats.com) for his first build. 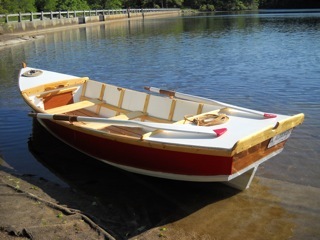 He wanted to build a boat mostly from found materials, and except for the luan plywood that he purchased, everything else was recycled. Over the winter of 2011-2012, Richard built the hull referring to Michalak’s book, Boatbuilding for Beginners (and Beyond) for guidance. Starting with the 4mm luan plywood, he salvaged packing crates made from yellow pine to create the framing, thwarts, cleats, coaming, and mast partners. He found a 16′ long pine board in the Hudson river and turned that into the chines and gunwales, while he turned some reclaimed cedar dekcing into his floor boards. Richard used stainless steel fastenings and Gorilla glue to fasten the hull together, then covered the bottom with a layer of 6 oz fiberglass cloth and epoxy. Keeping with his found material theme, he finished the boat with house primer, paint, and varnish, that he had bought previously. Richard even rescued the oars from the yacht club trash can, with some epoxy and paint they look good as new. Richard made several modifications to Michalak’s design, and calls his model the QTX (for Explorer). He kept a blog of his construction which you can see here. Richard plans to use WHISP on the inland waterways of New York.